I get it. I often become “camp-sick” myself! I long for the community, for time spent outdoors, and for dedicated focus on faith formation. Alas, my days of spending a week (or months) at camp are long over! I must admit – it was difficult to squeeze this time into my life! I sacrificed sleep, time with my family, and my sanity at work. But early in the day, as I sat quietly in a conference room, the sun shining brightly through big glass windows, I knew these sacrifices did not matter. I observed this group of adults eagerly soaking in this reminder that we have been given a promise by God – a promise of forgiveness of sins, redemption from death, and eternal life. I felt so completely filled with peace – and I knew I was in the place I needed to be! Regardless of the outside commitments fighting to pull me away, I needed to hear these words of Grace, and be empowered by hearing again the truth of my faith – God is for me! We have this tradition in corporate church that faith formation occurs through Sunday school – which in many churches will get you through middle school. All of this taking place at an age when most kids are more worried about what their peers think of them than how Martin Luther responded when considering what the Ten Commandments mean. Faith formation – which I would define as understanding how God is at work in the world, learning about the traditions of our church, and trusting the promise God gifted to each of us – is not reserved for our youth! The formation of our faith must happen throughout our entire life. Deepening our trust in and relationship with our God should never end. I am thankful for the ministry of my church camp, offering new ways for adults to learn! My visit to camp and witnessing my son’s camp-sickness is timely! 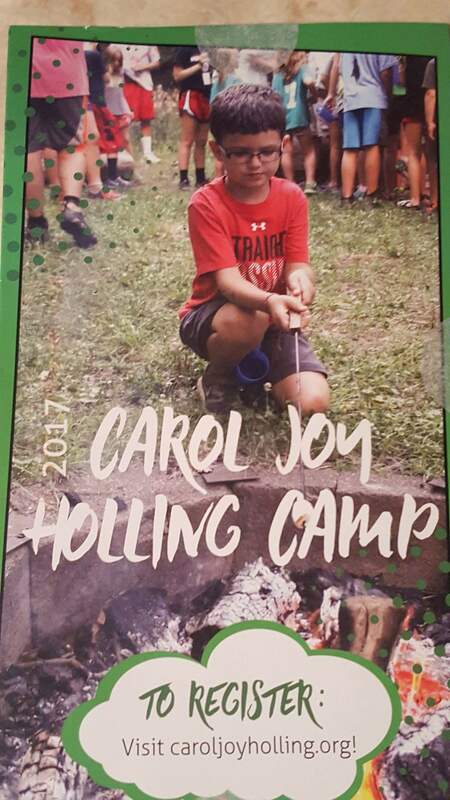 We received a flier in the mail this week promoting Carol Joy Holling camp, a place set apart and in many ways a home away from home for our family. Right on the cover is a picture of my son from last summer! Seeing him on this flier was the highlight of my week! Categories: Ministry | Tags: adult, camp, Carol Joy Holling, education, faith formation, God, grace, promise, schedule | Permalink.